I set a fairly ambitious goal at the beginning of 2018. I wanted to read more than I have been in the last few years. I decided that I wanted to read 24 books in 2018. Why was this an ambitious goal? Well, one of the struggles of having Hashimoto's autoimmune thyroiditis and Lyme co-infections is phenomenon described as brain fog. It has to do with an imbalance of hormones and/or build up of toxins in the body and brain. Practically, this means that brain fog can make it difficult to read or work or focus on things, especially for extended periods of time. At the same time, I know that I personally feel better when I read. I'm a researcher and learner at heart, so I love to read. I rarely read fiction. If I'm reading a book, 99.9% of the time, that book is non-fiction. Christian living, Bible study, theology related, self-help, productivity, biography, and similar are some of my favorites. I wasn't consistent with this goal, but I was persistent. In addition to buying a few Kindle and paper books, most of the time I bought Kindle books when on sale, borrowed ebooks through the Libby app from my local library, borrowed physical books from the library, and found some great choices in the Amazon Kindle Unlimited program. There were days and weeks when I didn't read at all, but then when my head was clearer I would read a lot. Guess what? By the June, I had met my goal! And by the end of the year, I had exceeded my goal! As of December 31, 2018, I had read 50 books plus the whole Old Testament! 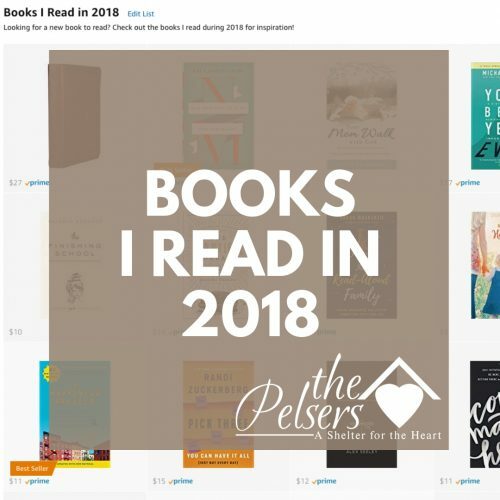 So do you want to know which books I chose to read in 2018? I gathered all of the books into a list on Amazon for you. Jump over to the Books I Read in 2018 list. By the way… You can follow me on Instagram and GoodReads to see what I'm reading this year.